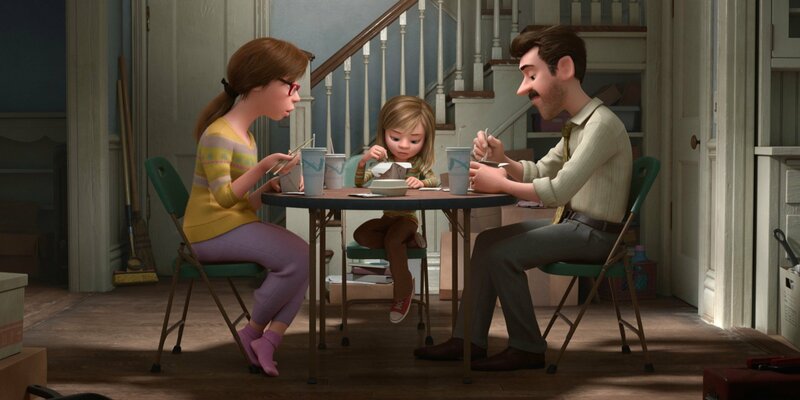 Pixar’s brilliant romp through human psychology (honestly, they cover more in this movie than my freshman psych course did), Inside Out, is another feather in the cap for the studio’s most accomplished director at this point: Pete Docter. The film won a much deserved Best Animated Feature Oscar last year. It’s not as funny a film as some of the Pixar classics, but it is endlessly imaginative and at times packs as big an emotional punch as any film in Pixar’s canon. The number of people who have told me that Bing Bong messed them up for days is stunning. That’s not to say that the film isn’t hilarious in parts while exploring human thought processes. The pinnacle of the look inside our minds is the dinner scene in which Riley’s parents do a pretty fine job of exemplifying the difference between how the genders think in a three-and-a-half minute sequence. It doesn’t just work for Inside Out, though. I found this brilliant smash-up of the dinner scene with Walter, Jesse, and Skylar from Breaking Bad cut together with the same mind processes and it’s just as good and just as funny. Pixar recently announced that the sequelizing of their previous films (with Cars 3, Toy Story 4, and Incredibles 2 on the horizon) will end and they’ll be back to making original features. That’s good news for all movie fans, because when they’re on, Pixar pushes the bound of imagination like no other studio can. Something happened to Pixar post-Toy Story 3…..it became just another animation studio. Whereas (with the exception of the abomination that was Cars 2) Pixar has been cranking out some of the best animated films ever created since 1995’s original Toy Story, the last few years have been just…good. But good isn’t good when great is the expectation, and ever since I heard the concept for Pete Docter’s (Monsters Inc, Up) film, I’ve been longing to see Inside Out. Docter does not disappoint and delivers Pixar’s most imaginative triumph to date. I’m not saying Inside Out is Pixar’s best film, but I can’t think of any other title in their catalog that has so many literally mind-blowing ideas stuffed into one movie. That concept is so brilliant, the only question was whether or not Docter could fill an entire film with ideas to flesh it out, and that is not a problem AT ALL. Inside Out explores so many concepts regarding emotions, the nature of memory, the complexity of feelings, how our memories define our personality, how our emotions work together in ways we never imagined and I haven’t even gotten into the subconscious, imagination (including imaginary friends) and nightmare birthday party clowns (I….hate….clowns). In fact, it’s not an exaggeration to say that my undergrad Psychology 101 was completely covered (and in a much more enjoyable way) in this 90 minute romp through the mind of an 11-year-old girl. The voice cast is outstanding, featuring mostly alums from Saturday Night Live and The Office, with Amy Poehler leading the way as Riley’s embodiment of Joy. Poehler gives the best vocal performance of anyone in an animated film since Ellen DeGeneres in Finding Nemo. She’s absolutely brilliant. So is there anything wrong with the film? Honestly, the only qualm I have, and this is exceedingly minor, is that the film is much more serious that you would think from the advertising and it’s such a deep probing of the inner workings of the mind that I don’t know if this film is going to resonate with kids the way that past Pixar classics have. Parents may leave with more to chew on then the rugrats. That’s not to say there aren’t some absolutely hysterical moments in this film. Once the initial framework of how things work is established, the funniest bits are when we zoom into the minds of other characters to see how their emotions are reacting. The dinner scene between Riley’s parents and a Riley being entirely run by Anger, Fear and Disgust is classic. The biggest laughs in the whole film, though, may be over the credits as you get to see inside the minds of various characters, so don’t get up right away. 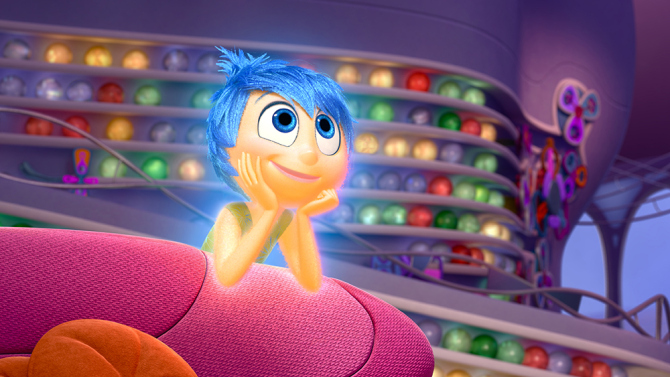 Inside Out takes its place in the upper echelon of Pixar’s best and snaps the studio out of a slump. Hopefully this fall’s The Good Dinosaur will continue the trend and we’ll have BOTH Pixar and Disney animation spitting out excellent films. Then again, sequels to Finding Nemo, The Incredibles and Toy Story (yes, again) are all in the works, so I’m hoping Inside Out doesn’t get lost in the Jurassic World mania and reminds the studio what they can do when they’re at their very best. Previous PostFour Amazing Star Wars Saga Mega Trailers!! !Next PostSite Note: Killing Time Passes 3,000 Posts!!! After letting this film percolate in my brain for a while, I can safely say it’s my favorite one. I like it better than the Incredibles. 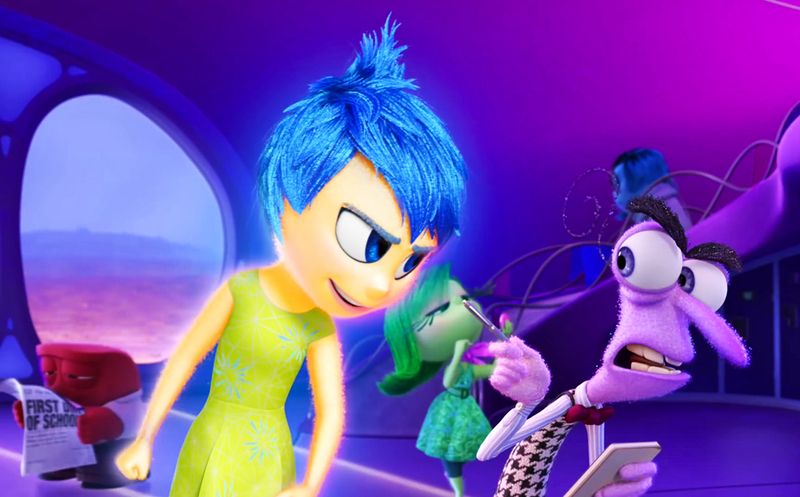 Instead of milking a gimmick like normal Hollywood people, Doctor and his team obviously spent years thinking about this movie, trying to make the most honest, universal, responsible, and (yes) erudite film possible, while working within the boundaries of “a Pixar movie.” Inside Out almost qualifies as science fiction. And really good science fiction, too. I honestly don’t think it’s a children’s movie. When I saw it in the theater, a lot of kids were whispering questions to their parents, clearly confused, and if Bing Bong’s fate traumatized me, I can only imagine what it did to the little ones. By the way, I’m sure Richard Kind is a wonderful guy in person, but I’ve never been able to stand him as an actor. Until he played Bing Bong, and made me want to cry. It’s not often that I think of a movie as a gift, but this one qualifies. Wow. Favorite Pixar is high praise. It’s definitely in the upper group. Mine is Up for personal reasons and because it’s incredible, but that’s Docter too. He’s elevated himself over Andrew Stanton and Brad Bird, who I think are 2 and 3 (Lasseter’s involvement with Cars franchising took him off the list) in Pixar’s directing stable. I also completely agree about Richard Kind. Before Bing Bong the only thing I could tell you is that I wanted to punch him for some reason every time I saw him. Cars was a questionable idea from the outset. So was Brave. That was the reason those movies failed artistically. Most Pixar premises carry a one-two punch though. The only Pixar movie that lacks a premise that’s appealing on the face of it is Ratatouille, but the message, about the importance of exceptionalism, more than makes up for THAT. Strictly speaking, Inside Out is not completely original, but it’s the most ambitious, most perfectly-realized Pixar movie to date. They had never taken on a premise so sophisticated before, and they had never run with an idea like the way they ran with this one. I have faith in Incredibles 2, and I pray that Toy Story 4 stands apart from the existing trilogy and its near-perfection, but after this spate of sequels is over, PLEASE Pixar remember what you do best. You totally stole “percolate” from me. I’m the only one who says that lol. Well you should be happy to hear then that Incredibles 2 moved up to 2018 today and Toy Story 4 was pushed back. I don’t want another Toy Story unless they’re going to wow me, but they’ll never have a better three movies open to close than what they already have. I think, given his body of work, Docter has to go in my top 5 directors at this point. 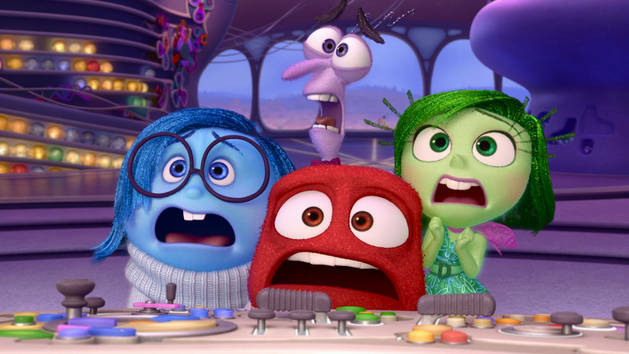 Part of the original Toy Story team, Monsters Inc, Up, and Inside Out? That’s straight classics down the line. Plus he co-wrote Toy Story 2 and WALL-E. Stanton would be my second as he co wrote the first two Toy Stories and then directed Nemo, Dory, WALL-E, and co directed A Bug’s Life (but then there’s John Carpenter, sigh). That would be “John Carter” lol. I actually thought it was OK, but a movie that expensive has to be more than just OK, and it can’t be saddled with the worst marketing campaign of all time. Seriously, it was just the words “John Carter” and a random shirtless guy fighting monsters in a gladiatorial arena. That was what they thought would inspire people to go see the movie. There was no premise, no explanation, nothing. I’ve never seen anything like it in my entire life, not before, not since. Frankly I can’t believe Disney is still letting Stanton make movies. I’m sure he’ll be consigned to animation for the rest of his career. That will be his penance. But that’s also clearly where he belongs, so it’s not so bad. Well when you’ve made the films he has as an animated director, he deserves to be brought back into the fold and the billion he brought them for Dory this year proves that was a wise move. Brad Bird’s in the same spot now. John Carter may have been better than Tomorrowland. At the least, they’re pretty much in the same ballpark of unfreakingbelievably bad lol. I honestly didn’t think John Carter descended to the level of badness. But then, I’m the one human being on the planet who had read the John Carter of Mars books and not Tarzan. I think more people probably HAVE read John Carter than Tarzan. I don’t even recall seeing a Tarzan collection in print. And so Edgar Rice Burroughs exposes the two, polar-extreme flaws in Hollywood’s current quest to exploit preexisting properties. First, Tarzan shows us that a well-known property does not guarantee a success, because familiarity does not equal popularity. Second, John Carter makes you wonder why Hollywood thinks they need to mine everything under the sun, instead of coming up with original ideas. The fan base for Monsterpocalypse is slim to nil; why did Hollywood treat it like a coup when they snatched up the film rights? Such a good movie by Pixar, one of the better ones. It was funny, joyful, sad, and entertaining.